http://www.lemac.com.au/site/DefaultSite/filesystem/images/sony/f55.jpg The new Sony F55 features a revolutionary electronic global shutter, you get superb dynamic range, the widest color gamut, and pristine image quality whether you shoot in HD, 2K or 4K. With the optional AXS-R5 recorder, the camera is also capable of 16-bit Linear RAW in both 2K and 4K. The new Sony F55 features a revolutionary electronic global shutter, you get superb dynamic range, the widest color gamut, and pristine image quality whether you shoot in HD, 2K or 4K. With the optional AXS-R5 recorder, the camera is also capable of 16-bit Linear RAW in both 2K and 4K. The PMW-F55 CineAlta camera shoots spectacular images with its 8.9 megapixels (effective) Sony 4K image sensor. You get superb dynamic range, the widest colour gamut, and pristine image quality, whether you shoot in HD, 2K, QFHD or 4K. * Recording onto the optional AXS-R5 recorder. ** Requires CBK-55PD codec board. The F55 is exceptionally small, light and modular, letting you build up the right configuration for each job – or each shot. The camera includes cache recording functions and has an easy-to-access customised user menu that sits on top of the setup menu. As well as the choice of formats and internal and external recording options, you can attach a variety of viewfinders, including the revolutionary optional DVF-EL100 OLED viewfinder, PL-mount, FZ-mount and still lenses, including second-generation Sony PL-mount lenses, and extra long-life Olivine – Lithium Iron Phosphate – batteries. The chassis is only slightly wider than a typical PL-mount prime lens, perfect for 3D rigs. An optional shoulder rig (CBK-55BK) provides best ergonomics, flexibility and usability for shoulder operation. Version 5.0 firmware increases the functionality of the PMW-F55/F5. Upgraded functions include: DNR (Noise suppression) in Cine-EI mode; Memory A/B White Balance in Custom mode; assignable Colour Bars On/Off; assignable VF Magnification On/Off; changing FPS (STEP) with Menu knob (push for 2 seconds); the Double Speed VF setting remains while switching HFR On to Off; and simultaneous recording on SStP 422 SQ at 59.94i (SStP and MPEG 50). Version 5.0 also supports additional codecs, including ProRes 4444* with the installation of the optional CBK-55PD codec board. It is also possible to assign EI value to the Gain Switch in Cine-EI mode** and 3200K/4300K/5500K to White A/B/Preset switch in Cine-EI mode**. Wireless Audio settings can also be set via the “WRR” page**. * Requires CBK-55PD firmware update 2015. ** These functions require the attachment of CBK-55BK build-up kit. The PMW-F55's Sony 4K image sensor captures a true 4K 4096 x 2160 DCI-standard cinema image. Its 4K CMOS sensor features 11.6 megapixels (total) and 8.9 megapixels (effective). Capture RAW at your choice of resolutions: the camera's native 4K or beautiful, derived 2K. RAW recording preserves the greatest latitude for colour correction and other post processes. Sony's 16-bit recording captures more tonal values than the human eye can differentiate. Sony RAW retains 16 times as many Red, Green and Blue gradations as 12-bit RAW and 64 times as many tones per channel as 10-bit recording. Sony 16-bit linear RAW is also the ideal point of entry into the 16-bit linear Academy Color Encoding System (ACES) workflow. The bolt-on AXS-R5 recorder records onto sleek, high-capacity AXSM™ memory cards, which are compatible with an affordable optional USB 3.0 reader, the AXS-CR1. Once on a PC, the RAW files can be screened using Sony's free RAW Viewer software. AXSM memory provides a super fast, affordable format for sensational quality recordings. The F55 CineAlta camera allows you a choice of internal recording formats in addition to 16-bit RAW 2K/4K recording output onto the AXS-R5. The camera incorporates high-speed SxS PRO+ memory card recording that allows the choice of: 8-bit MPEG-2 HD422, 50Mbps, MPEG-2 HD422 XAVC 422 Intra (up to 222Mbps), SStP 422 (220Mbps) and SStP 444 (440Mbps). MPEG4 SStP+Proxy simultaneous recording (SR-SQ 422/444 on 29.97p only) allows faster transfer and less storage capacity needed. This is ideal for editing while the hi-resolution files will be used for grading. The F55 features high-data-rate on-board XAVC HD recordings up to 60 fps, plus a free planned upgrade to XAVC 4K, QFHD and 2Kup to 60 fps and XAVC 2K/HD up to180 fps. It also offers 240 fps 2K RAW with the optional AXS-R5 outboard recorder, achieving the highest frame rates most productions will need, while retaining exceptional, 16-bit image quality. The F55 records internally onto SxS memory. High-speed shooting and the highest quality recording options require next-generation SxS recording media – Sony's 128 GB* SxS PRO+ memory card – which can be read by the next-generation USB card reader, the SBAC-US20. * 1 GB equals one billion bytes, a portion of which is used for data management functions. Sony provides a coordinated "off-line, on-line" workflow with simultaneous recording to internal SxS cards and the optional AXS-R5 RAW recorder. For seamless conforming in post, you get matching time code, start frame, stop frame, file names and other metadata. The camera supports the following RAW + Onboard combinations: RAW 4K/2K + 2K/HD, RAW 4K/2K + MPEG-2 HD422 and RAW 2K + XAVC QFHD/4K. Sony understands a fundamental truth: working cameras require practical workflows. That's why the F55 is part of a larger production platform that includes affordable media cards, affordable card readers, free RAW Viewer software and compatibility with popular NLEs and finishing tools. Recording directly in Apple ProRes codec and Avid DNxHD codec are also available as hardware options. The DNxHD or ProRes files can stored in the easy-to-manage MXF OP-1a wrapper, and recorded onboard to Sony’s SxS PRO+ memory card format, which was specially designed to handle mission-critical production applications. The ability to render tones from deepest shadows to brightest highlights is a crucial test of any digital camera. The F55 excels, with an impressive 14 stops of exposure latitude, extraordinary low-light sensitivity and extremely low noise in the blacks. Sony believes that your camera should not limit your colour palette. That is why the F55 incorporates the same advanced colour filter array technology as used in Sony's flagship F65, which is equipped with the industry's only 8K sensor. You get a colour gamut that's not only wider than other digital cameras, it is even wider than motion picture print film. S-Gamut/S-Log3 (Log Gamma that is close to Cineon gamma curve) allows users experienced in the Cineon workflow to start grading more easily. A digital interface on the F55 allows for a variety of optional viewfinders, including the DVF-EL100. This 0.7-inch* viewfinder has the incredible clarity of 1280 x 720 High Definition, plus superb OLED brightness, contrast and response. The DVF-L350 3.5-inch* LCD viewfinder has higher resolution (960 x 540) than previous Sony viewfinders, plus ten times the contrast. And the eyepiece flips up for direct monitoring. The DVF-L700 compact 7-inch* LCD viewfinder enables high resolution when shooting in 2K and 4K, not to mention pixel-for-pixel 1920 x 1080 representation of your HD images. The optional Sony shoulder rig provides comfortable handheld operation, hour after hour. The rig is sturdy, lightweight and features industry-standard rosettes on both sides for quick and easy attachment of third-party hand grips and other accessories. The small size of the F55 is particularly welcome in stereoscopic 3D shooting. The chassis is only slightly wider than a typical PL mount prime lens, perfect for both mirror rigs and side-by-side configurations. The F55 is designed to accommodate PL-mount, FZ-mount and still lenses. With the PL-mount adaptor, you can take advantage of acclaimed cine optics from Angénieux®, Canon®, Carl Zeiss®, Cooke®, FUJIFILM®, Leica® and more. Slip off the supplied PL-mount adaptor to reveal the native FZ mount with 18 mm flange focal distance. It's perfect for accepting commercially available adaptors for still lenses, including Canon® EF, Canon FD, Nikon® DX, Nikon G, Leica® M and even 2/3-inch broadcast B4 lenses. There's also Sony's game-changing FZ-mount auto focus servo zoom: the SCL-Z18X140. The F55 works with Sony's second generation, cost-effective PL mount prime lenses. Thanks to refined glass, all are certified for 4K capture, while minimizing geometric distortion, vignetting and breathing. A 9-blade iris delivers beautiful bokehs. The focus rings rotate 240°. The series includes focal lengths of 20, 25, 35, 50, 85 and 135 mm. For easy lens changes, all have the same T2.0 aperture, the same external diameter, matte box diameter, and gear locations for follow focus and aperture. All are the same size except for the 135 mm. Carefully designed with significant input from cinematographers, the F55 provides an incredibly rich range of controls. And the interface is nicely intuitive. Instead of diving through menus, you get direct, one-touch access to key shooting parameters including frame rate, shutter speed, colour temperature, ISO sensitivity and gamma. Assignable buttons mean that favourite adjustments are always at your fingertips. A user customisable menu sits on top of the setup menu allowing users to access a choice of up to 20 menu items more quickly and easily. Menu control on sub display also allows you to set up without using the attached viewfinder. A selectable colour marker is available for users to use their favourite colour marker that is visible even in light conditions while shooting a white background. The camera offers powerful connections, including real-time 4K output to a compatible monitor. It is made possible by four 3G-SDI outputs. There is also HDMI®, USB, DC in connection, a removable XLR audio module and a removable time code/genlock module. The XLR inputs accept balanced analogue signals, provide 48-Volt phantom power and will accept four channels of AES/EBU digital audio with an expected firmware upgrade. HDMI V2.0 support for 4K and QFHD at 29.97p, 50p and 60p allows users to connect Sony and other manufacturers’ 4K TV sets to display 4K from the camera. The F55 takes advantage of Sony's innovative BP-FL75 battery pack, which uses Olivine – Lithium Iron Phosphate – instead of conventional Lithium Ion cathodes. The result is a substantial increase in charge-discharge cycles, compared to previous Sony batteries. The Olivine battery works with Sony's BC-L90 quick charger. The camera is also compatible with Sony's BP-GL95A, GL65A, L80S and L60S batteries, which use the BC-L70 and L160 chargers. The traditional CMOS image sensor uses a 'rolling' shutter that can result in images with unwanted distortions like motion skew and flash banding. That can be annoying, especially when shooting visual effects or 3D. Anything but typical, the F55 electronic Frame Image Scan. Rolling shutter distortions aren't minimised, they are completely eliminated. When it comes to production, one recording mode emphatically does not fit all. That's why the F55 gives you not one, but four useful recording formats. All four are recorded internally, onto Sony's established, affordable SxS media. ** Compared to previous professional AVC Intra-frame only encoding. From stunts and explosions to the fall of a single raindrop, high-speed shooting is a powerful storytelling tool. 180 fps with a planned upgrade (XAVC 2K/HD). Unique to this process, there is no line skipping or sensor windowing. So there's no crop factor, no loss in angle of view. 240 fps 2K RAW, with the optional AXS-R5 outboard recorder and a planned upgrade, achieves the highest frame rates most productions will need, while retaining exceptional, 16-bit image quality. This not only exceeds 12-bit RAW with 16 times as many Red, Green and Blue gradations. By design, it exceeds the capabilities of human vision! The F55 is a next-generation camera, featuring high-data-rate on-board recording of XAVC 4K today and 180 fps XAVC 2K/HD with a free planned upgrade. This requires next-generation SxS recording media—Sony's 64 and 128 GB* SxS PRO+ memory cards—and a next-generation USB card reader, the SBAC-US20. Sony understands a fundamental truth: working cameras require practical workflows. That's why the F55 is part of a larger production platform that includes affordable media cards, affordable card readers, free RAW Viewer software and compatibility with popular NLEs and finishing tools. Some Super 35 digital motion picture cameras are dedicated to PL-mount cine lenses. Other cameras tap the growing trend of shooting with affordable still lenses. The F55 was designed from the ground up to accommodate both. PL-Mount Lenses. Take advantage of acclaimed cine optics from Angénieux®, Canon®, Carl Zeiss®, Cooke®, FUJIFILM®, Leica® and more. Still Lenses. Slip off the supplied PL-mount adaptor to reveal the native FZ mount with 18 mm flange focal distance. It's perfect for accepting commercially available adaptors for still lenses, including Canon® EF, Canon FD, Nikon® DX, Nikon G, Leica® M and even 2/3-inch broadcast B4 lenses. 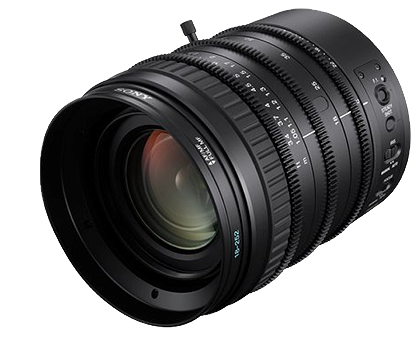 FZ-Mount Lenses. There's also Sony's game-changing FZ-mount auto focus servo zoom: the SCL-Z18X140. With the F55, Sony introduces our second generation of cost-effective PL mount prime lenses, featuring a dramatic improvement in build quality. Thanks to refined glass, all are certified for 4K capture, while minimizing geometric distortion, vignetting and breathing. A 9-blade iris delivers beautiful bokehs. The focus rings rotate 240°. The series includes focal lengths of 20, 25, 35, 50, 85 and 135 mm. For easy lens changes, all have the same T2.0 aperture, the same external diameter, matte box diameter, and gear locations for follow focus and aperture. All are the same size except for the 135 mm. Carefully designed with significant input from cinematographers, the F55 provides an incredibly rich range of controls. And the interface is nicely intuitive. Instead of diving through menus, you get direct, one-touch access to key shooting parameters including frame rate, shutter speed, color temperature, ISO sensitivity and gamma. Assignable buttons mean that favorite adjustments are always at your fingertips. The high-resolution status display confirms major settings for confident operation. Six soft keys above and below the display are context sensitive and give you direct access to key shooting parameters. The camera offers powerful connections, including real-time 4K output, up to 60p, to a compatible monitor. It's made possible by four 3G-SDI outputs. There's also HDMI®, USB, DC in connection, a removable XLR audio module and a removable time code/genlock module. The XLR inputs accept balanced analog signals, provide 48-Volt phantom power and will accept four channels of AES/EBU digital audio with an expected firmware upgrade. At Sony, we don't just know about cameras. We're also a leader in battery technology. The F55 takes advantage of Sony's innovative BP-FL75 battery pack, which uses Olivine—Lithium Iron Phosphate—instead of conventional Lithium Ion cathodes. The result is a substantial increase in charge-discharge cycles, compared to previous Sony batteries. The Olivine battery works with Sony's BC-L90 quick charger.